JASPER, Ga – Arrested on June 24 for charges including cruelty to children and false imprisonment, Neil Roger Farrell and Janet Lynn Farrell met for a hearing on setting Bond for the couple pending their criminal case. Facing allegations of confining their daughter Olivia to a bedroom with limited restroom break and periods where she was simply given a bucket as well as allegations of striking Olivia on her feet with industrial size glue sticks, the Farrells have already attended a bond hearing in late June. At that time the defense asked for and was granted a continuance for the case. The court reconvened at the Pickens County Courthouse, Superior Court, under Judge Frank Mills on July 18 at 10 a.m. Lasting until after 6 p.m., the case’s arguments centered on the possibility of setting a bond for the Farrells or not. The prosecution requested denial of any bond while the defense requested a $50,000 bond for each defendant. Both Neil and Janet are being represented separately in the case by Scott T. Poole, of Grisham & Poole, and J. Daran Burns, of Burns Law Group, P.C. 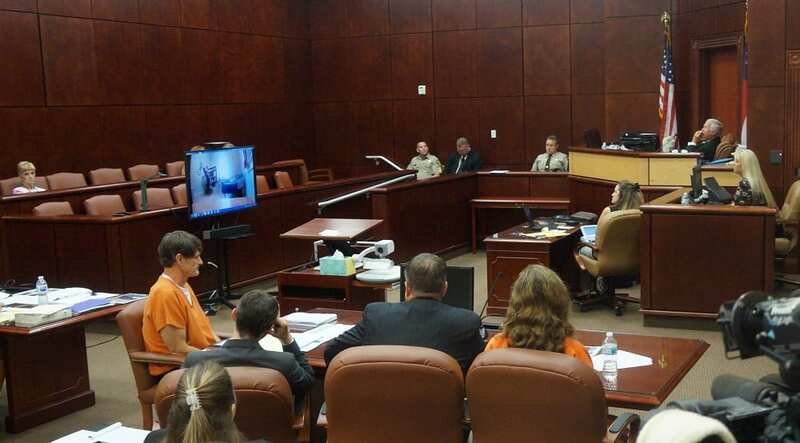 District Attorney for the Appalachian Circuit, B. Alison Sosebee, presented the case against the Farrells with two witnesses, Captain April Killian and Detective Michael Jaques. The state contends that evidence indicates that Olivia Farrell, adopted daughter of the defendants was confined to her room with the door lock reversed, so she could not leave at will, as well as a contact alarm on the door that would sound if it was opened. They also allege that Olivia was beaten on her buttocks and feet with 10-inch, industrial glue sticks. An allegation that Sosebee says was corroborated by Neil Farrell’s own admission as well as from the couple’s other daughters. After Olivia went missing, officers were told by the Farrells that Olivia suffers from a disorder known as Reactive Attachment Disorder (RAD)as well as Fetal Alcohol Syndrome (FAS) since before they adopted her, this plays into the charge of Exploitation and Intimidation of Disabled Adults. With the bond hearing focused directly on the idea of setting a bond for the defendants in the case, the day focused on if the courts should allow the Farrells out of jail on bond until the official case commences. Neil Roger Farrell looks on as the state presents evidence from Arlo security cameras that the Farrells allegedly used to monitor their daughter Olivia. One of the prosecutions main points for denying bond was concern over the defendants tampering with evidence. With evidence of video footage collected in the house from security cameras set up to monitor Olivia’s room, the prosecution stated that the Farrells had removed everything from Olivia’s room as punishment for her stealing her sisters ipad. However, once they discovered her missing, they went back to the room and put everything they had removed back into the room before searching and eventually having a gate guard call 911 to report the missing person. They claim this as the Farrells having already tampered with evidence as they took time to return all the furniture and items to her room before contacting the police, further delaying their own search as well as an official police response and search for the child. Further, the prosecution offered up a witness, Cpt. April Killian of the Pickens County Sheriff’s Office. Killian has been a part of the search and investigation and testified that when officers found Olivia, she said she did not want to go back home. As the police began interviewing her, they began discovering points of the case. Killian also testified that when she returned to the residence on June 24, the cameras in Olivia’s room had been moved. When the Farrells arrived at the Pickens County Detention Center after Olivia had been found and were waiting in the lobby, Killian noticed the couple were utilizing their electronic devices. After getting a search warrant for the devices, officers confiscated these devices and downloaded the devices. Yielding 23,000 pages of data in messages and photos and other data, Killian noted a few of the messages found. Later in the case, investigations into the phones usage at the time the Farrells were at the jail revealed they were looking at GPS monitors and ankle monitors. Continuing the argument of tampering with evidence, the prosecution points to an email sent from Janet Farrell to Ashlyn, the Farrells oldest daughter. The email instructs several things in an itemized list. One of these items instructs the daughter to, as read in the courtroom, “go onto my FB account and deactivate it, and if anything on there is bad due to news on my wall delete for me…” The email also gives information and passwords to accounts including the Arlo Camera account, the security cameras placed in Olivia’s room. District Attorney B. Alison Sosebee, right, questions witness Cpt. April Killian, left, about the Farrell’s treatment of their daughter Olivia. Killian also testified that when she turned on one of the Farrells laptop seized during the investigation, an email program popped up. She noticed the number of emails in the inbox decreasing as she looked at the screen. As if the emails were being deleted. Killian says she turned off the laptop and waited “a substantial amount of time” and then turned it back on. At that time, the loss of messages did not continue. Moving past the concerns of evidence tampering, Sosebee told the court that the prosecution was also concerned with the possible flight risks of the Farrells if bonded out before the trial. The prosecution’s second witness, Detective Michael Jaques testified that he dealt with four search warrants into the Farrell’s home. When he entered the home on July 6, Jaques said he noticed the office was not in the same way it was on previous searches. He noticed a black backpack on the floor open. Inside he found checkbooks and passports for the family except for Olivia. While he was unaware of who had been in the office and gotten into the pack, a later witness, Jezekiel Vanderdecker, admitted he had gone to the house at the request of Neil Farrell to get a checkbook and glasses out of that pack. The state alluded to this being additional evidence to tampering as well as a show of intent and means to flee the country if allowed a bond. However, in Vanderdecker’s testimony, he could not recall if he had seen passports in the bag or not. The state also put forth financial records for the Farrells as evidence of substantial means for leaving the country. The financial reports presented for observation by the court confirmed the Farrels income into the hundreds of thousands over the last two years as well as a brokerage account close to $1 million. They also presented tax assessors reports on the Farrells property into the hundreds of thousands. Additional reports indicated foreign income and “ties” to foreign countries that could indicate aid in escaping the county. The prosecution noted that the Farrell’s eldest daughter is also a missionary in Papua New Guinea as well as several trips the Farrells had taken during their life as expertise in travel and previous experience in traveling to Australia and other locations. Stating that the numerous trips and connections to the countries could also make it easier to flee, the prosecution adamantly asserted that the flight risk of the Farrells was substantial. The state also alluded to concerns about the Farrells intimidating witnesses and affecting testimonies. While they indicated much of the allegations against the Farrells including the use of the industrial gluesticks that had been used on Olivia. They also noted that other daughters had corroborated the stories. While it was not stated specifically, the state could call upon these daughters to testify in the trial about these allegations and their witness to the actions. A joint defense was presented during the case on behalf of Scott Poole and Daran Burns during the day. Providing six witnesses of their own, the defenses main contention in favor of bond was an overwhelming show of support from the Farrells community as to their character and trustworthiness to appear in trial after a bonding out of jail. Also responding to many of the points the prosecution had made, the defense presented their case to say that the Farrells were, in fact, so rooted in their community spiritually, interpersonally, and financially, that they would never think of running, but needed the time and space to prepare their case with access to their lawyers not limited by the detention center. Responding to the state’s concerns of tampering with evidence, the defense questioned Killian what the Sheriff’s Office had left to do in the investigation. Pointing to the electronic devices and data that Killian said was still being gone through, the defense asked Killian where the data was located. Killian responded by saying that most of the data was on hard drives and flash drives. The defense suggested these devices were in police custody and out of reach of the Farrells. Additionally, they noted that the Arlo camera footage account had had its passwords changed by authorities and could not be accessed by the Farrells. They noted the email the prosecution presented with Janet instructing her daughter to deactivate her Facebook account saying that the email was a preemptive move to protect herself against social media. They stated that the deactivation of an account does not delete the account, and they noted that the email was simply asking the daughter to delete any posts that may have been mean or hurtful words against her. It was not an attempt to tamper, but rather an attempt to protect her reputation. Killian also stated that the continuing investigation would likely result in further interviews being necessary with those involved in the case. A fact the prosecution suggested could be an opportunity for the Farrells to affect or intimidate such testimony. The defense’s responded that most of the people involved had already been interviewed and if new information was found, it would be reinterviewing people that have, at this point, already gone on record with recorded testimonies that they cannot change. They continued saying that most of the witnesses of the prosecution would be officers, suggesting that they could not be intimidated by the Farrells. As for the financial status of the Farrells, Poole noted that simple means of escape cannot be assumed as a substantial threat of escape. The defense went on to say that the success of Neil’s business and the Farrells financial status were actually roots tieing them here. The prosecution’s suggestion of foreign ties because of $5,000 in foreign income was a ludicrous assumption without supporting evidence. The finances also indicate over $100,000 in charitable giving. 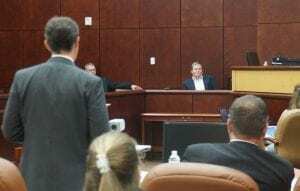 The defense even called a witness, Joel Barrere, pastor of Life Bible Church in Holly Springs, who affirmed the Farrells were faithful attendees as well as faithful givers to the church. The defense asserted that the financial means available would not have been so heavily spent on their defense, such as hiring two law firms to represent them, if they had plans to flee. 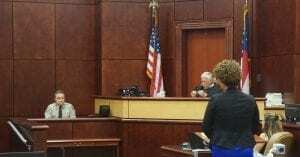 Attorneys Scott L. Poole and J. Daran Burns present witnesses for the Farrell’s character defense in their bond hearing on July 18, 2018. Providing 5 other witnesses to affirm their belief in the Farrell’s connections and efforts in the community, the defense also offered numerous written statements to add weight to the assertion that the Farrells are actually grounded into their community both financially and interpersonally. Marshall Thomas, a fellow church member at one time, noted he also had a child with Reactive Attachment Disorder. He testified in his time spent with the Farrells never caused him concern and called them “good, loving parents.” He went on to testify that he had never seen them discipline any of their children without cause. He did testify that corporal punishment was not a good idea with his child suffering from RAD, saying that the child would not respond well to it. He noted that kids with RAD could potentially develop deep or inappropriate relationships with people. He noted that it would be a great cause for concern if Olivia was walking alone across the county. Asking each of the witnesses if they had any reason to believe the Farrells would not show up for court if let out on bond, if they had any reason to believe the Farrells would intimidate witnesses or commit a crime, and if they would have concerns with continuing their relationships with the Farrells. With all six confirming their trust and connections with the Farrells, the defense set their point of the quality of the Farrell’s integrity in the community. The prosecution revealed details of the allegations to the witnesses asking if it caused the witnesses concern to learn of the details, an action that the defense pointed to in their argument saying the prosecution twisted witness testimonies with unproven allegations. They continued saying that the Farrells were more than willing to voluntarily surrender their passports and submit to any conditions the court would place on bond. Judge Mills went on to say that he believed that the fears of tampering with evidence and fears of leaving the country could be alleviated with conditions on the bond. Stating “being out is better than being in,” Judge Mills ruled to set bond at $100,000 each for Neil and Janet Farrell, but also with set conditions set: Surrender Passports, no internet access, GPS monitoring, home confinement, and no contact allowed with the victim or witnesses for the state. The Judge did note that he would alleviate the no internet access after 60-days with the ability of either side to request a change later. There will be details worked out among the attorney on how to deal with the internet access restrictions and how to have Janet taken to a doctor for existing medical conditions. It would appear that these parents were involved in an unconventional therapy called “Attachment Therapy” and its parenting (aka Nancy Thomas parenting). See http://www.childrenintherapy.org for reliable info about this highly abusive practice.